Hill Top Home of Comfort in Killdeer, North Dakota serves 75 patients in its nursing home facility. The staff’s tasks became more difficult due to unreliable technology. To start, they took their computers to the repair shop every few weeks. “Every other week, we were having to take this computer or that computer in, and it just started adding up. It was $200 here and $500 there,” said nurse Stephanie Harderson. Hill Top’s wireless Internet cut out often, leaving the staff to their back-up matrix software. Their printers and copiers lacked advanced features, such as scan to email and print volume by user. Their phone system needed updating. And none of their devices were speaking to one another. In addition, all staff members had the same password. Their server was out in the open, atop a filing cabinet. “It was very unsafe,” said Administrator Gerry Leadbetter. Harderson explained their Internet and computers experienced issues frequently. “We are with Matrix care, and that system requires good Internet because that is where all of our nursing charting is and it’s how we deliver all of our medications.” Employees couldn’t access patients’ medications and treatment lists without fear of the wireless service crashing. Leadbetter said he felt frustrated by the unreliable technology. “In electronic medical records, IT is so important to have working. Our wireless was a huge problem in our building,” said Leadbetter. While imploring their Internet providers and sending multiple computers in for repairs, the staff tried to continue without trustworthy devices. “We finally decided we needed a whole new plan. I was tired of living up here day and night,” Leadbetter said. On top of its IT issues, Hill Top had an outdated print fleet. With a dozen printers and two copiers, staff prints sheets for doctor’s visits and appointments, calendars, schedules, etc. “Our newest machine was probably at least ten years old,” said Harderson. When they couldn’t handle the unpredictable equipment anymore, they turned to Marco. A colleague at another medical center recommended Marco to Leadbetter, who then called for assistance right away. After their Marco Technology Advisor established a plan, Leadbetter and Harderson felt confident. They implemented Managed IT and Managed Print Services at the nursing home. “We have what I call a ‘complete package’ with Marco. We have technology; we have the printers; we have the cameras; our phone system is now there,” Leadbetter said. 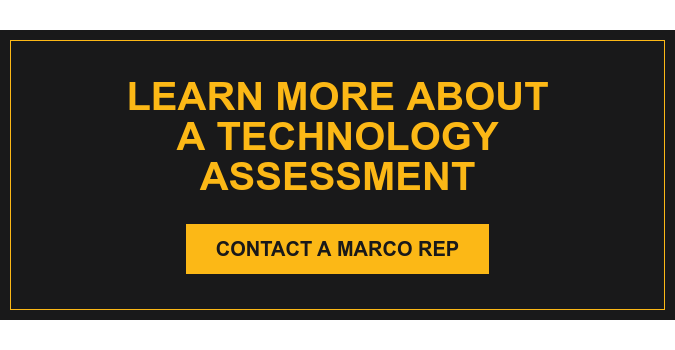 Although the implementation took time, Marco specialists virtualized the server, added a backup server and two cloud facilities, installed firewalls, fixed their wireless access points, encrypted emails, installed the phone and camera surveillance system and upgraded printers/copiers. “After we decided to become a whole package, it was going to eliminate so many of our problems. Now we have it all under one umbrella and saved money doing it,” Leadbetter said. Hill Top’s system is integrated, allowing them to transfer calls, send emails to printers, access servers and cameras, and more. “You’re going to have equipment and it breaks, but not having to do that [repair devices] every week is nice.” Even better, with their decision to lease, they receive upgraded equipment, a major advantage for Hill Top. During the installation, their server unexpectedly went down for two days; still, Marco and Hill Top stayed resilient. “Marco warned us that there was going to be some transition time, and there definitely was. The installation process, that first six months to a year, there were things that no one anticipated,” Harderson said. Both Marco and Hill Top staff have created a strong relationship and understanding. Marco’s support desk staff is always willing to help, giving the 24/7 access the medical facility requires. On-site and remote assistance has added peace of mind and reliability to the operations at the nursing home. “Anyone can come sell you stuff, but it’s what you get down the road. Our sales rep and network systems engineer and the rest of the team at Marco, they are always there for us,” Leadbetter said.